Windsor Corporate Center, within Leland Industrial Park, is located at the intersection of Andrew Jackson Highway (Hwy 74/76) and Mercantile Drive NE in Leland, NC. There are currently four parcels of land available for sale or build to suit. 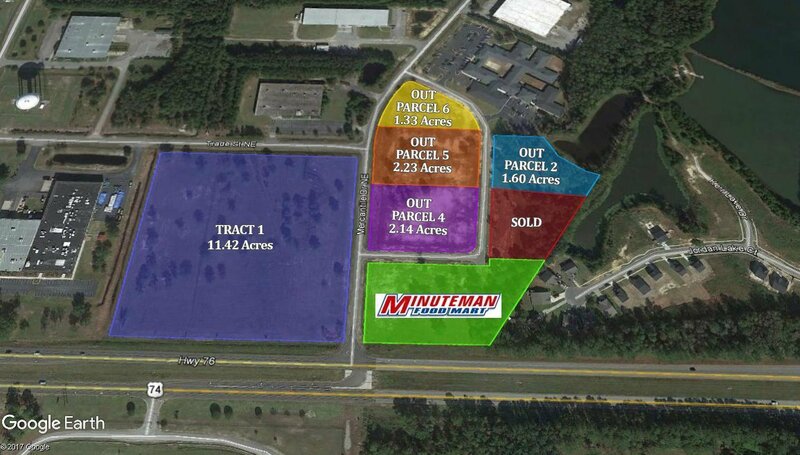 All parcels are zoned CI (Commercial Intensive) and offer frontage on either Mercantile Drive, Andrew Jackson Highway (Hwy 74/76), or Windsor Corporate Center Drive. Windsor Corporate Center is located in the Leland Industrial Park, which is home to many of southeastern North Carolina’s leading employers in both the office and industrial sectors. There is a retention pond already in place that serves all four parcels of land. All sites in the Park offer municipal water and sewer services. There is a new traffic pattern for the Park with access from both directions onto and off of Andrew Jackson Highway (Hwy 74/76). Cody Cress and Tyler Pegg of The CRESS Group of Coldwell Banker Commercial Sun Coast Partners are the listing agents for the four parcels of land for sale in Windsor Corporate Center. Contact Cody or Tyler for more information.